This is a long-awaited book by three colleagues I have greatly admired throughout my career, so it is my pleasure to write this review. As I would expect from Little, Dam and Legenhausen, this volume starts with a clear and practical description of an autonomous language classroom where even at a beginning level, learners are involved in using the target language while managing their learning from day one. This sets the scene for the book which is rigorous and theoretically grounded, yet also practical in nature. After giving a brief overview of the contents, I will explore some themes that resonated with me. These are related to theoretical ideas, and practical and political implications. Part 1 comprises chapters 1 to 4 and explores how learner autonomy is operationalised in a classroom in four key ways, drawing on the case of a real class of Danish teenagers learning English. Part 2 comprises chapters 5 and 6 and explores evidence of success in autonomous classrooms. This evidence comprises a longitudinal study investigating linguistic gain, and two case studies of very different learners demonstrating inclusion in an autonomous classroom. Part 3 (chapters 7 and 8) starts with a premise about the need to respond to large-scale migration before going on to present two case studies. The first case study is related to language education for adult refugees, and the second to linguistic inclusion in a classroom in Ireland in a primary school catering for immigrant children with some 49 home languages. Chapter 8 discusses matters related to teacher education for learner autonomy. The authors conclude with some comments on plurilingualism (i.e. being able to speak two or more languages) where the best way of reaching language learning outcomes would be through widespread application of the autonomous classroom. The best feature of this volume is the significant contribution that each of the authors has already made to the field of learner autonomy and the ways in which they draw upon their substantial experience to bring together a cohesive, compelling, and decisive message. Key points are presented clearly and returned to time and time again. Each chapter is situated appropriately in the existing literature and all of the chapters are seamlessly interconnected. In short, it is a real pleasure to read. At the end of each chapter there are some reflection questions to help readers engage with the ideas, to intentionally reflect, and to make connections with their own contexts. There are also some helpful pointers for further reading along the way. Although many of the ideas are not necessarily new, especially to those of us who have been interested in this field for a long time, they are very well pulled together and form a thorough and engaging overview of decades of dedicated research and practice in learner autonomy. For colleagues unfamiliar with the field, this book is an excellent – and essential – starting point. Knowledge is socially constructed; i.e. interaction is necessary for learning. Learners are full participants of the learning process. The target language (TL) plays an important role not only in communication, but also in metacognitive growth. TL use / output (i.e. writing and speaking) is necessary in language classes and requires deeper language processing and more mental effort than receptive skills. The TL is a tool used not only for communication, but also for the development of metacognition. Dialogue is crucial and human development is a “never-ending interaction between the social-interactive and individual cognitive domains” (Chapter 2, Paragraph 14 where the authors draw on Bakhtin and Vygotsky). Learners need to have opportunities to build on “existing knowledge and interests to support the acquisition of proficiency” in a new language (Chapter 3, Paragraph 1 where the authors draw on Deci and Ryan). It is impossible to do this book justice in such a short review, but there are several key themes that I would like to share. These themes are: target language use; the importance of writing in the language classroom; and language as an instrument of communication and thought. I have read much by the authors over the past 20 years, so I am familiar with their stance on target language (TL) use, but the message is particularly well explored throughout this book. The authors give three reasons for taking such a strong view on TL use. The first is the obvious one that if we are learning to speak a language, we need as much practice as possible in that language. This will help us to internalize the language, pay attention to grammatical and phonological features, and develop fluency. The second is that substantial TL use within an L2 classroom leads to the promotion of incidental learning as well as intentional learning. Thirdly, there is still uncertainty about the role of explicit grammar instruction in language education, but whatever view you take towards grammar instruction, TL use spontaneously allows for grammar to emerge naturally through authentic communication. Another key point the authors make is that the TL serves both a communicative and metacognitive purpose: the “TL itself is the channel through which, as far as possible, the learner’s agency should flow” (Chapter 3, Paragraph 2). This means that planning, monitoring, evaluating, making choices, exercising responsibility, and developing a capacity for managing learning should all be done through the TL so that the TL becomes an instrument of discursive thinking and reflection. The authors note “TL use that is at the centre of the learning process is authentic and spontaneous, metacognitive as well as communicative, and calculated to exploit learners’ interests” (Chapter 6, paragraph 1). Writing is a “precondition for reflection that lies at the heart of autonomous learning” (Chapter 1, Paragraph 13). The authors claim that writing enables learners to express their autonomy “in and through the TL” (Chapter 1, Paragraph 13) as is a way of documenting the learning process. In practical terms, Dam’s classrooms have famously made use of logbooks and posters which I will elaborate on in the next section on practical implications. Whereas some researchers/practitioners choose to separate the development of language proficiency from the development of learner autonomy, Little, Dam and Legenhausen make a strong case for considering language and autonomy development together. Language is seen as the medium of communication and also the instrument of thought. The authors advocate the strong version of communicative language learning concerned with teaching language through (and not simply for) communication. As I mentioned earlier, this book is also practical in nature and there are several applications that even veteran teachers can consider in order to enhance their own classrooms. The practical applications discussed here will relate to learner roles, logbooks and other artefacts, managing learner control, interactive and collaborative learning, and evaluation. Experimenter whereby they gradually develop “explicit analytical knowledge of the TL system”. Intentional learners who gradually develop “an explicit awareness of affective and metacognitive aspects of language learning”. The basic principal of the autonomous classroom is that “learners take responsibility for what they do” (Introduction, Paragraph 4) and this is demonstrated through the practical classroom activities. For example, learners keep a logbook in order to document their learning, where they write down details related to the content of lessons, vocabulary, details about projects and evaluation on their progress. Students also create portfolios of their work. An important point to note is that although the teacher collects the logbooks periodically, she/he does not correct any errors. Written comments take the form of positive feedback and suggestions. The logbook serves as a tool for documenting learning while reinforcing the important role of writing in the TL. Dam’s autonomous classrooms also make use of posters. Posters are a way for learners to collaboratively explore language use related to a topic of interest within an autonomous language classroom. Other written artefacts that are explored in part 1 of the book are portfolios of work, word cards, learner-produced games, learner-produced books and magazines, and other communicative texts with accompanying pictures. Focus on learning rather than teaching. Give the learners models for managing their learning (at different phases). Respect learners’ contributions to their learning. See problems as obstacles that can be overcome collaboratively. Keep learners (and parents) informed about the teaching/learning approach. Some practical tips are given for helping learners to become willing to take control, e.g. inviting their input and opinions about classroom management and activities, drawing up some dos and don’ts together, making learners aware of the curriculum requirements, and giving them choices. One way that incorporating learner interest and choice into the classroom activities is through a series of work cycles. These cycles provide a necessary structure and sense of security for the learners. The cycles contain planning, decision making, implementation, documentation, and evaluation. With each cycle, the learners become more proficient at managing their learning. Naturally, this is done as much as possible through the medium of the TL. The structure of the class might contain “Teacher’s time” where the teacher can introduce the aims and structure of the lesson, “Learners’ time” where groups work on projects that they themselves have decided; then “Together time” where learners can share their work. This portion always includes some kind of evaluation. The logbooks (the learners’ and teacher’s logbooks) document all of these learning activities. Chapter 2 gives plenty of examples of activities that get learners working and talking together either in pairs or in small groups. One such activity is a two-minute talk where learners not only communicate in the target language, but also reflect and evaluate themselves afterwards. Other activities include discussion cards, collaborative text production, and board games. Tasks such as these illustrate how the theoretical considerations are enacted in practice and are activities that other teachers can adapt for their own autonomous classrooms. Of prime importance are the opportunities for dialogue, and socially constructed learning within a safe and engaging learning space. In an autonomous classroom, learners evaluate their own learning processes from an early stage and monitor their progress and proficiency over time. For example, learners can evaluate a lesson and their own contribution during the lesson or activity. They may also be involved in peer assessment. This can be done using a scale, but a written reflection might also be appropriate. A compelling aspect of the book is the case studies and projects that are presented in detail. For example, the authors outline in detail the Language Acquisition in an Autonomous Learning Environment project (LAALE) which was a longitudinal project which looked at students in schools in Denmark (an example of a mixed-ability autonomous classroom) and Germany (a high ability class using a textbook). The project investigated learners’ grammatical and pragmatic performance (but did not attempt to generalise). Chapter 5 highlights several findings, but the striking one is how favourably the autonomous classroom students performed in measures of vocabulary, grammar and pragmatics. Chapter 6 begins with an explanation of ‘inclusion’ which is defined by UNESCO (1994) to be an all-embracing concept designed to ensure that schools accommodate all leaners regardless of their background, challenges, or gifts. There are some affinities between inclusive education and the autonomous classroom in that “all learners are respected and valued equally” (Chapter 6, Paragraph 1) and are given choices which they are accountable for. The chapter contains two case studies drawing on multiple data sources (students’ logbooks, teacher’s logbook, and classroom artefacts). The first student was a disruptive and restless student, while the second student had severe dyslexia. For both these learners, the autonomous classroom created a safe and supportive environment that enabled them to progress well and enjoy English. The authors write that they were “two learners who for very different reasons could easily have been left behind in a more traditional classroom. Both of them, however, responded to the challenges of the autonomous classroom, accepting responsibility for their own learning and taking control” (Chapter 6, Conclusion). Chapter 7 continues the focus on inclusion and on case studies, this time on inclusion of immigrants. The authors claim that “in an age of large-scale migration, autonomous learning is also the surest way of providing for the linguistic, social and educational inclusion of immigrants” (Chapter 7, Paragraph 1). The first case study focuses on Integrate Ireland Language and Training (IILT), which is a not-for-profit company, funded by the Irish government, based at Trinity College Dublin. The organisation operated from 2000 to 2008 with the aim of providing intensive English language education for adult refugees. The students were from diverse backgrounds and in order to cater for different interests, needs and goals, students were encouraged to find ‘real world’ materials relevant to them. As with other examples of autonomous classrooms, students were engaged in planning, monitoring and evaluating their own learning right from the beginning, which needed mediation, modelling and support. The European Language Portfolio proved to be a useful tool for the mediation. The second case study presented in Chapter 7 concerns the language development programme offered to primary school students at St Brigid’s School for Girls in Dublin. In this case, a central role was assigned to the learners’ interests and prior knowledge which was used to trigger their intrinsic motivation. Learners were also engaged in documenting, managing, planning and monitoring their own learning. …the question-and-answer tradition has its origins in the hierarchical organization of our societies, and the responding role that it assigns to learners implies the subordination of a passive majority. The promotion of autonomous learning is a political act because it challenges entrenched tradition, notwithstanding the fact that national curricula routinely include many of the features of autonomous learning among their goals – critical thinking, reflective learning, sometimes even learner autonomy itself. Programmes designed to help teachers establish autonomy classrooms must be clear about their political implications (Chapter 8, Paragraph 7). Teachers may operate on the assumption that simply embedding choice and learner control into classroom practices is effectively promoting autonomy. However, the authors help us to look more deeply at the underlying political motives. Learner autonomy is a pursuit of democracy, and we should start with this political assumption in order to frame our classroom practices. For example, the Council of Europe’s educational projects have always focussed on developing the capacity of individual citizens to contribute to the democratic process. Language learning has the potential to enhance an individual’s range in relation to their social, cultural, political, intellectual/academic and vocational/professional capacities. After challenging traditional teacher education programmes, Chapter 8 gives a thorough account of the Common European Framework of Reference for Languages (CEFR) which could be an alternative tool. The authors describe how the CRFR could be effectively used to promote the autonomous language learning process particularly as its focus in on real language use. To summarise, this is an excellent book and one that will become a key reference for language teachers and researchers. It draws upon years of dedicated practice, research and collaborative theorising. It shares some important and compelling theoretical ideas supported by research-based principles and practical applications. In addition, it suggests some future directions. Plurilingualism is playing an increasingly central role in language education projects in Europe, mass migration is adding an interesting and complex dimension to our linguistic landscapes, and the concept of inclusion is reaching our school systems. The obvious response to this is an approach which promotes ownership and learner autonomy. Jo Mynard is an associate professor at Kanda University of International Studies (KUIS) in Japan. She is the Director of the Self-Access Learning Center (SALC) and Director of the Research Institute for Learner Autonomy Education (RILAE) at KUIS. She holds an M.Phil. in Applied Linguistics from Trinity College, University of Dublin, Ireland and an Ed.D. in TEFL from the University of Exeter, UK. 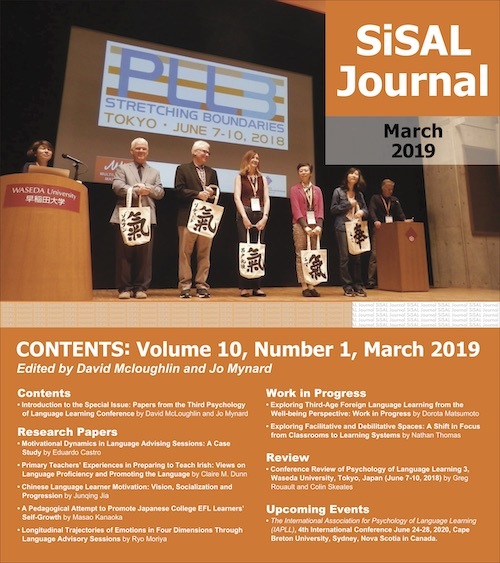 She is the founding editor of SiSAL Journal.